Say good morning to Sunday Brunch with Mimosa it's 5 o'clock somewhere!!!! It will be a bright sun shiny day! Even some non alcoholic drink recipes enjoy! Fruits for garnish orange slices, strawberries etc. Dip glass into the natural sugar by wetting the rim in water first. Fill half of a champagne glass with 4 ounces of chilled champagne and another 4 ounces of OJ, stir and top off Grand Marinier or Peach Schnapps then garnish with orange slices, fresh strawberries. Mimosas definitely turn brunch into something really special. I love that you added a video to this post - next time, we want to see YOU on the video! Sounds like a great party drink! Thanks for the video too. 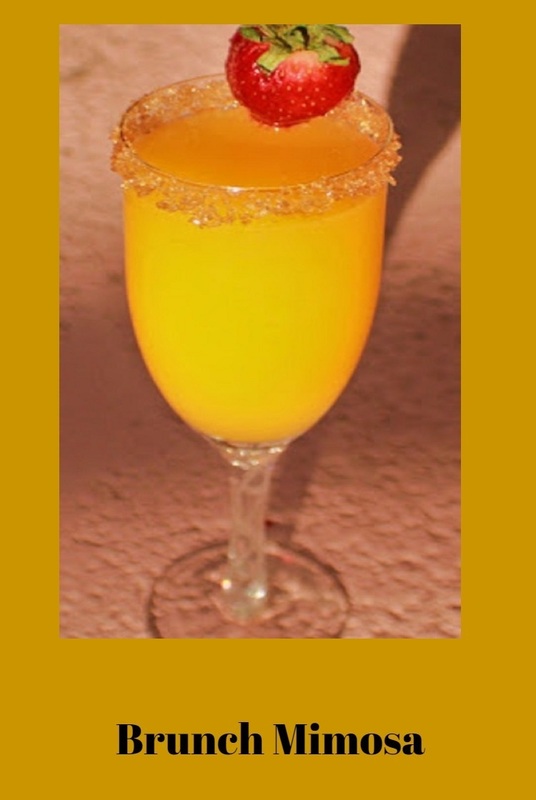 Love your Mimosa recipes; we have them on special occasions to celebrate a birthday, or an event...have not had it for brunch in a long time. It looks so bright and sunny. Totally inviting and would be a perfect Florida sunshine brunch cocktail...nice idea, and yummy too! Have a wonderful Sunday, Claudia! We're both big fans of mimosas and I like the idea of the different fruits. We add peaches to our margaritas when the orchard on the hill above us starts producing. I like my mimosas pretty dry - fill glass with champagne and add splash of juice :-). BTW - thanks so much for removing the word verification. The peach mimosa here is really the one I am dying to try. I have a big bottle of nectar waiting to be used and this is a delicious way to make use of it. However, all your varieties are well worth pouring up on a warm Saturday afternoon. Hope you are enjoying the weekend! I'm really disappointed. I was expecting you to be flipping and spinning the bottles like Tom Cruise in Cocktail. I think you would make a good extreme bartender. Oh, I think I'd love a peach mimosa, too! YUM! This may be a repeat, but I'd love a peach mimosa! They sound incredible!!! I love a good mimosa! I really want to try the peach! Wow, this is lovely! I like it very much! I love Mimosas. You feel so special drinking one, don't you? Good thing you included a non-alcoholic version because this is one I would want to drink very often. Oh I love mimosas in the morning! This looks fantastic :) Refreshing and delicious. These look refreshing and delicious. I love treating myself to a mimosa on the weekend with brunch. Thanks for sharing.